When I was about eight, my parents took me to see The Black Stallion at the Keego Theatre, a movie house where they played second-run shows for a buck. Onscreen, a storm is raging. Passengers of a luxury liner jump into life rafts. A young boy cuts free an agitated, tied-up horse, and it leaps from the boat. The horse’s angry owners hold the boy at knife point before he is flung into the dark, choppy waters. I am hysterical. Sobbing. Unable to catch my own breath. I do not know the horse will rescue the boy. That the story is just beginning. My mother pinches me under the arm. “Do we have to go out to the car?” she asks. My feelings are too big for my family. This is what I believe, true or not. It is why I often watched television upstairs in the guest room, alone – my emotions leaking out with Folgers commercials and documentaries on PBS. It was a source of teasing – mostly good-natured – in my family. But I was too sensitive to realize it. Sitting in the Davis Theatre watching Epic – Artist’s Date 24 – I remember all of this. The fear. The anxiety. The shame that is tied to these feelings. I am experiencing it now. I’m old enough to know that good will prevail. This is a PG movie. 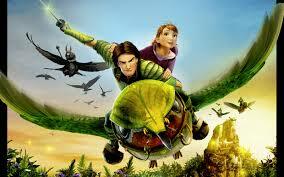 I know that the Leafmen will “win,” that the pod will bloom in the full moon, that the forest will be saved. There’s this loud, foreboding music. Crescendo rising. Bats flying. Forest dying. The Images are dark. Mandrake, nemesis of the forest, of life itself, wears a rat skin like a hooded cape. I feel my heart quicken, a desire to turn my eyes away. I am afraid. I do not trust it will end well. I am the only adult in the theatre without a child in tow and I feel a little bit self-conscious. I retreat to my head. Do the parents think I am suspect? A child molester? Why aren’t the children afraid like I am? A dad ducks and scurries out, gripping two little hands, one in each of his. Are they frightened? Or do they have to pee? I saw the trailer for Epic a few weeks ago, on another Artist’s Date. 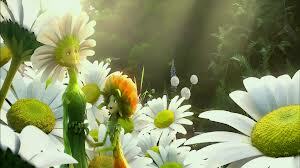 I was enchanted by its beautiful images – flower-people, with heads like cotton pom-poms, dandelions turned to seed. Faces on sunflowers and gerbera daisies. I was called by its questions about belief. Professor Bomba’s unshakeable belief in something he can’t see, but only knows. Like God. Like Horton Hears a Who. His willingness to be perceived as crazy. His willingness to lose seemingly everything for his belief. I learn that love can bloom riding gently on a deer. And a pod that blooms in full-moon light is the source of all creation. That hummingbirds make great horses, but common brown sparrows can do the job too. I am reminded that relationships between fathers and daughters are sometimes hard. And that it’s ok to hold on to someone you hardly know – if they offer you a hand or a torso and you need one. That each of us has a purpose – even slugs and snails. We might not know it. Don’t always ask for it. But we can embrace it. And continue to put one foot in front of the other. That life is about finding out what we are capable of. How high we can jump to get ourselves out of a hole. And that each of us can learn to fly. That we all experience loss. Of a parent. Of a friend. And that sometimes, love comes back – oftentimes in the most unorthodox and unexpected of ways. Queen Tara’s energy, twinkling light like Tinkerbell, speaking to Ronin and to MK after she has left this-worldly plane. MK’s reunion with Nod, straddling “normal” and Lilliputian-sized worlds for the promise of connection, of love. I think of my own recent reunitings, seeing someones I never thought I’d see again … and then did. The tears stream down my face. Gratitude. Beauty. Joy. I feel their salty release. I notice them, like I notice the fear, and do nothing. I let them roll off of me in the darkness. I can sit with them. They are not too much for me.